Libby is pretty sure she didn’t kill her husband. Maybe her serial killer father can help her figure out what really happened before she is found guilty and sent to prison for life, just like him. Libby Carter grew up with a loving mother and father – the quintessential suburban family. But she is deposited onto an emotional tilt-a-whirl when her father confesses to being the infamous “I-75 Strangler”. Against all odds, Libby finds love and stability with her husband Ryan. Waking up to find her husband in bed beside her with his head nearly blown off was a horrendous shock, and the fact that she escaped unscathed shoots her to the top of the suspect list. Libby is left to wonder if she is truly capable of murdering the man she loves. After all, she can’t remember anything after their big argument the night before. Plus, she’s the daughter of a serial killer, so there’s that. Perhaps it’s in her DNA. Libby risks her life to clear herself and find Ryan’s killer. The story makes an abrupt twist when she discovers someone is out there…watching her every move. She unexpectedly finds herself face-to-face with her stalker and in a fight for her life. LIKE FATHER, LIKE DAUGHTER is the first in a thrilling trilogy about love, family and redemption. Buy a copy: You can buy a copy of this book on Amazon. Connect: For more info about her other books check out Christina Morgan‘s website. I was raised in suburban Central Kentucky in a family full of right-brainers. With a photographer/artist for a grandfather and an author/illustrator for a mother, I was bound to turn out on the creative side of the spectrum. I honed my writing skills in school, winning awards for my essays and short stories. I tried my hand at about every sport imaginable, which only went to prove that my efforts were better spent in other creative outlets such as art, singing, and writing. But it was writing that really stuck with me and I spent the next several years trying my hand at writing fiction novels, just for the fun of it. I took a break for a while and focused on putting myself through paralegal school while raising two amazing Irish twin girls. I quickly learned that being a certified paralegal was the best career choice I could have made. On top of all of the cool cases I have worked on over the years, I was able to write original legal documents autonomously. When a national magazine for attorneys approached me in 2013 to write a short story for them about the life of a paralegal, I jumped at the opportunity. When the article was published and garnered me some amazing feedback, I realized how much I missed writing for leisure. I sat down and wrote my very first full-length fiction novel that year and haven’t stopped writing since. I love reading (all genres except sci-fi), folk music, caramel macchiatos, puppies, thunderstorms, antique jewelry, dragonflies, the color purple (not the movie), and I enjoy a large sweet tea from McDonald’s every single day. Can you image the nightmare waking up and finding your husband of 8 years lying dead next to you? Killed with a single shot. And the thing is, you didn’t hear a thing. You just went to bed like every night and woke up like this. Do you think the police would believe you? Your friends? Will there still be any friends left? Well this is exactly what happened to Libby. She’s at the center of this story and has to make her own way out of this mess if she doesn’t want to end up behind bars. I got swept right in. Ryan and Libby had a good marriage, not perfect, just normal you know. No financial problems, no enemies. The only one with motive and opportunity is Libby. The police isn’t doing their hardest either finding someone else to fit the crime. Should she attempt to take a plea bargain for something she didn’t do or just take her chances and risk the death penalty? What a difficult choice to make! The only hope she has left is doing a little digging on her own and see what skeletons come out of the closet. Libby is convinced she didn’t kill her husband. Well as sure as she can be with this blackout. She loved him and couldn’t have done that. But then again, murder runs in the family, what if she has it in her genes, in her blood? It seems weird to say but I strongly thought Libby was innocent from the very beginning, I believed her immediately, her reactions felt honest, her questions logical. If she needed a friend she could count on me, along with her mother and her other friend Dani. The pace was steady and it had a good flow that kept my attention all the way through. I wanted to keep on reading and was craving a happy end. It was easy to put myself in Libby’s shoes and to follow her thoughts and actions. The author has impressively captured the realism in this exceptional situation. The ending felt good and satisfying but not all that anticlimactic or surprising to me. I’ve read too many novels in this genre already to have me led on. 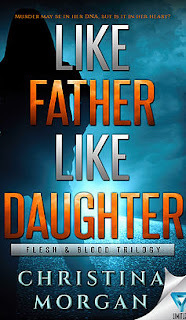 Like Father, Like Daughter reminded me very much of Linwood Barclay’s novels. Barclay happens to be one of my favourite authors and he too uses domestic scenes and ordinary people whom you can easily correlate with. The last chapter is holds a little teaser for the second book of this trilogy and I can tell you that this one also holds a lot of promise. I am very happy I got the chance to read this excellent novel and I look forward to continuing the series. I received a free copy of this book from GenuineJenn in exchange for my honest opinion.